If you haven’t seen the action from the final round at the X Games Rally Cross in Munich, you need to watch this. The Rally Cross cars always produce some exciting action, but in Munich at the X Games on Sunday, the action got even more intense for Sverre Isachsen in the #11 2013 Subaru WRX STI. In the final race, shortly after the start, he gets bumped and his Rally car gets up on two wheels in the middle of turn one. Sverre Isachsen found himself in a pack of 10 cars setting up for turn 1 when he was bumped and that’s when it started getting intense for the Viking Warrior. The impact sent his 600 horsepower Subaru WRX STI off-course when a second impact pushed him further offline into the barricades. This sent Isachsen up onto two wheels and it looked like his Rally car was going over. It appeared to those who were watching the race that he was definitely going all the way over, but the tightly packed powerful cars supported him and Sverre safely brought his Subaru back down on all 4 wheels and continued the race. Completely unfazed by the incident, Sverre put his driving skills to use and was able to advance to 4th place. Isachsen and the #11 WRX STI held that position until the very last lap (9 of 10), where he was two turns from the finish line. In an aggressive move, Ken Block in the Ford Fiesta ST, drove into Sverre spinning him out. Block was excluded from the race because of the incident, but the spin caused Sverre to drop from 4th to 8th in the final results. The result was a big disappointment to an otherwise outstanding performance by the Viking Warrior and his #11 Subaru WRX STI. The Ford Fiesta ST cars took first, third and fourth spots in the race with Toomas Heikkinen winning the gold medal. Liam Doran took second overall with LD Motorsports driving the Mini Copper. It was an exciting weekend of Rally Cross racing as the cars battled rain, dirt and asphalt and of course each other. The Subaru team left Munich without a medal and packed up the Rally cars and equipment for an air shipment across the Atlantic. The team will regroup and prepare to be on U.S. soil for the next event which takes place in 6 days at Louden Motor Speedway in New Hampshire on July 11. Watch the exciting final race as Sverre Isachsen battles the field on two wheels. 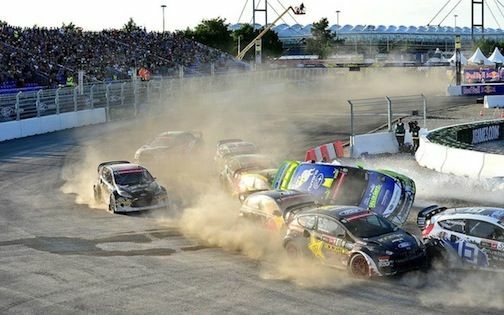 Watch Ford RallyCross Final Race X Games Munich 2013 video.